Want a powerful tool that helps you create more lending opportunities by managing activities that lead to more business? MyCRMDashboard from Continuity Programs is much more than a marketing tool. It generates leads, testimonials and three times more repeat business for your lending institution. Save time by reducing the number of hours originators spend looking for leads and referrals. Spend time building customer relationships, improving the overall customer experience. Use custom dashboards and executive reports to manage customer satisfaction and measure KPIs. 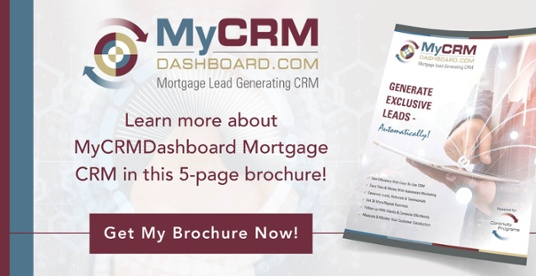 Continuity’s MyCRMDashboard is a fully-integrated platform that gives lenders the solutions they need to grow their mortgage business and drive more lending services per household. Follow-up with clients and contacts is effortless and the system is specifically designed with an eye towards retaining lifelong mortgage customers. ClientTracker™, which generates leads for pre-approvals and new mortgages. eConnections™, automated, hands-free, personalized email campaigns. Appreciation & Satisfaction™, an electronic thank you card and survey component. MyCRMDashboard also offers upgrade options. Connections™ Program helps you make the most of your customer database by combining email and direct mail marketing. ClientTracker™ Mailing automatically delivers a personalized mailing to a contact when they list their home. SurroundMail™, lets you target the neighbors of your recent customers. 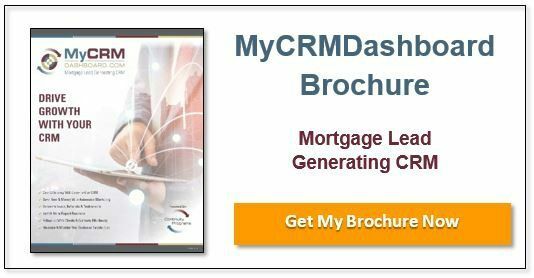 Mortgage lenders face unique challenges in generating quality leads. Technology like MyCRMDashboard helps guide the way by allowing you to break through and find new growth opportunities. Continuity Programs is partnered with MGIC to offer a white-labeled version of the system to it’s lending clients, called MGIC Elements.